Improbable Press and I are very pleased to announce that The Adventure of the Colonial Boy is having an official launch! The Adventure of the Colonial Boy is a Holmes/Watson romance set in Australia in 1893. Murder! Dangerous sea voyages! Deductions! Snakes! Honour, angst, and chases! Unrequited love, requited! When: Wednesday 30 March 2016. 6.30 for a 7pm start. The Adventure of the Colonial Boy is already available as an ebook, and it comes out as a paperback on 31 March. I have a limited number of copies ahead of time, so come to the book launch and get an early copy, at the special price of AU$15. 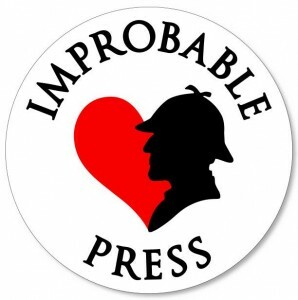 Because Improbable Press is a small press based in the UK and this event is being run on the scent of an oily rag that Sherlock Holmes has deduced was recently in John Watson’s vicinity, we’d like to thank Penny Blue for providing the space for the launch free of charge. Please support Penny Blue by buying a drink or two, and support Improbable Press by buying a book! Here are some of the reviewer comments on The Adventure of the Colonial Boy so far! I bought the ebook because I couldn’t wait – and ended up reading it in one day.– Denise, Goodreads. This was a romping good read, and absolute page turner that I couldn’t put down. – Sally Koetsveld, Goodreads.